ROSWELL – Shikar Safari Club International has named New Mexico Department of Game and Fish Cpl. 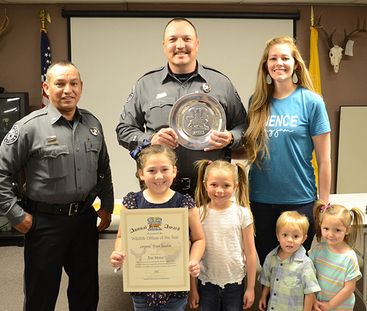 Tyson Sanders the 2018 Wildlife Officer of the Year. This highly prestigious award is given annually to a state officer whose efforts show outstanding performance and achievement among sworn conservation law enforcement personnel. Sanders began his career with the department in 2009, spending his first year in the Mora district before relocating to the Roswell district. His eight-year career has seen numerous successes in investigating and prosecuting numerous high-profile big-game cases. Education and community outreach also have been a significant part of Sander’s focus. He has led over 20 public outreach events in the Roswell area in the past few years, including bringing back the Roswell Outdoor Adventure Day at the Spring River Park and Zoo. Through the department’s Open Gate program, Sanders has assisted local landowners with obtaining access for hunters, ensuring sportsmen and women can take advantage of wildlife habitat that would otherwise be closed to them. The recognition was presented by Department of Game and Fish Col. Robert Griego, a 2006 recipient of the award. Shikar Safari Club International is a conservation-based international organization that presents awards annually to wildlife law enforcement officers in all states, provinces and territories in the United States and Canada.